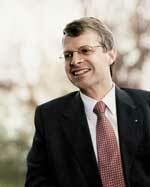 Peter Wuffli departs as CEO of Swiss Banking giant UBS. But his departure was far from plain sailing for the board members who had convened in Valencia to support the Swiss team in the America’s cup. Although allegedly supported by Chairman Marcel Ospel, Wuffli has taken the hit for recent operational setbacks. Are we seeing an example of a corporate culture compulsively attracted to boardroom battles in response to commercial difficulties? From time to time in these posts we have remarked on a company that seems to suffer a series of board-room conflicts, and attempted coups. The departure of Peter Wuffli of UBS makes a nice case for studying such board room battles, and considering whether there might be an underlying pathology in corporate culture contributing to a tendency towards repeated dismissals of their leaders. The Financial Times today suggests that Peter Wuffli has paid the price for UBS stumbles’. Peter Wuffli is a highly regarded manager. His stumbles seem to centre around a failed in-house fund (Dillon Read Capital management). The share price of USP has held up well. Zurich-based financial giant UBS has a disconcerting habit of dispensing with senior managers without warning. Luqman Arnold was shoved out as chief executive officer in December, 2001, and replaced by Peter Wuffli in circumstances shrouded with mystery. Wuffli will leave the bank and be replaced by Marcel Rohner, the deputy CEO and chief of UBS’s most valuable business, private banking (or Global Wealth Management, as it is officially known). The key figure in the board room carnage is the powerful Chairman of UPS, Marcel Ospel. The official version of events has Ospel seeking to win board approval for Wuffli as his own replacement on stepping down next year. This week he reported that the board rejected his proposal indicating that such an appointment was not in the outgoing leader’s gift. The board also had reservations about Dr Wuffl’s performance. There’s something that doesn’t add up in the official version of events. The board is stacked with powerful and experienced executives, leaders in their own right. They are widely believed to be largely hand-picked by Marcel Ospel. Observers have doubted that they would oppose him on a matter of judgment over a propopsal that he felt deeply was in the interests of the company. Furthermore, the indications are that the board of USP continues to support Ospel’s strategy and has indeed nominated him for a further term as leader (chairman). I can’t see how things have turned out as they have. If Marcel Ospel was all-powerful and had stacked the board with his appointed supporters why and how did they oppose his wishes? If they resisted his efforts to appoint his favored candidate, why were they keen to appoint Ospel for a further term, against his original wishes. Did they feel that, unlike Wuffli, the chairman had made no significant contribution to the travails of the company since 2001? I have no doubt that further information will emerge on these matters. A suggestion. Corporate culture remains a fuzzy concept. Maybe there is some merit in an investigation of permanently conflicted organizations. The condition is more commonly recognized in political organizations, with a relentless internal battle for the top jobs within political parties. We might be able to identify the early-warning symptoms, with the potential for remedial actions (as accompanies analyses of an organization’s financial state of health). You are currently browsing the archives for the UBS category.